Buying a wood stove requires careful research to find the one which is just right for you and your home. A very popular choice with our customers is the Little Thurlow. Designed and built by Yorkshire's Town and Country Fires, this top quality British-made stove will last for 50 years or more. The Little Thurlow's curved door and classic lines make it an ideal centrepiece with first-glance impact. At the same time, its understated appeal means it is equally at home in any traditional or contemporary interior. Designed with lower fire openings in mind, this 520mm-tall stove is suitably compact; nevertheless its generous glass window perfectly captures that magical view of your living fire, a cosy and reassuring welcome for family and friends. 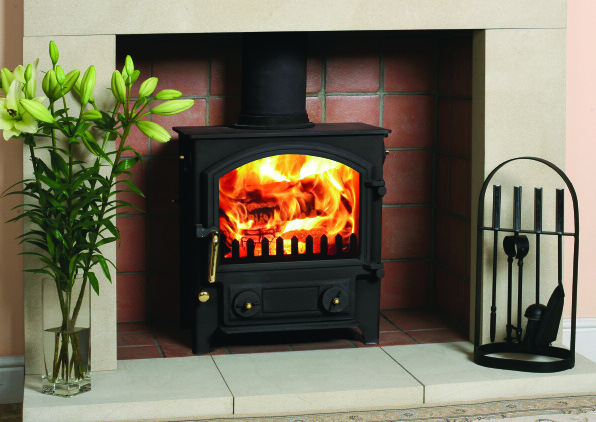 This steel-manufactured, hand-finished stove, with strong welded seams and a choice of brass or stainless steel fittings, is guaranteed to maintain peak performance throughout countless cycles of expansion and contraction over its working life u2013 unlike bolted cast iron stoves which are brittle and often prone to air leaks, corrosion and cracking. As Town and Country point out, our bridges were formerly cast-iron made and are now entirely steel-manufactured for very similar reasons. Named after the Thurlow family, founders of Town and Country Fires in 1977, the Little Thurlow stove benefits from the wealth of experience built up by the company and its staff over the years. Alongside this proud tradition, Town and Country have incorporated and developed new combustion technologies producing some of the best, energy-efficient stoves purpose-built for the modern world. Modern innovations on the Little Thurlow stove includes an air wash which keeps the glass clear, preserving that wonderful view of the fire, and a tertiary air feature. Situated at the rear of the firebox near to the 6" flue, this allows an extra burning cycle which ignites and burns gases given off during normal burning, which would otherwise escape into the atmosphere. The result is a cleaner and more efficient burn producing more heat, and the eco-friendly removal of pollutant gases. In performance, the multifuel Little Thurlow delivers a 5kW output for effortless room heating and achieves just slightly below 80 per cent efficiency burning logs up to 350mm, or solid fuel. Besides the standard version, a DEFRA-approved Smoke Control version is available for wood burning in controlled areas. As with all Town and Country stoves, the Little Thurlow model is Hetas-approved and thus meets the most stringent industry standards.